There are so many different kinds of tarot card spreads that it becomes really baffling to choose the right one. But there are two popular card spreads that can be safely taken up by the newbies as they are both effective and easy to use. The most commonly used spread is Celtic Cross, also known as Gnostic Cross, gives you a fairly clear idea of the character and the personality profile of the subject. This spread uses ten cards out of which five cards are arranged in cross and four are placed vertically besides the cross. The central card of the cross is considered the significator. The reading gained from using Celtic cross card spread is like a photograph or a stop action picture of the client. It can be a cross section or a slice of their life. This kind of reading is suitable for animals and human beings but not situations. 12 Card spread, on the other hand, is useful for reading people, situations, financial problems, business issues, relationships and other situations where lots of interaction takes place. This card spread offers a dynamic and moving picture of the people and the situations wherein they are involved. The reading provides a comprehensive picture of the present, past and the future. It tracks the chain of cause and effect. This spread is quite flexible and allows the reader to use multiple card signifiers to analyze complex situations. You can expand certain situations and delete others and move back and forth in time. An expert tarot reader can even trace the causes of the certain events to the past lives of the people involved. You can also predict the future on the basis of your assessment of the present and the past. In case of Horse Shoe spread, there are seven cards which are arranged in semi circle or placed in V-shape. The cards placed from the left side and moving to the right are known to indicate the influence of the past and the present times. It also represents the obstacles and expectations including hopes and fears of the client. These cards also reveal what course of action would suit the client best and what its outcome would be. The cards in the three-card spread are used to divine the past, present and the future of the questioner. While the first card indicates the past, the second represents the present and third card is used to predict the future. The astrological spread consists of twelve cards which are spread to form a circle. Each of these twelve cards represents a sign of the zodiac. A thirteenth card, which is placed in the middle, is the signigicator. Another card spread is called Tetractys. It consists of ten cards which are placed in four rows forming a pyramid. Each row represents the four elements of nature, the earth, fire, air and water. These elements have a great significance in witchcraft as well. 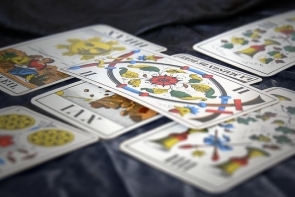 A tarot reader may also decide his own spread depending upon his own personal experience and preference. Tarot cards have, of late, become a popular tool for divination of a person’s nature and his future. They are used to gain insight into the current, past and the future life of the client seeker. The cards ultimately represent the spiritual forces that control the human life and its circumstances. The famous psychologist Carl Jung was the first to attach significance to the divinatory value of the cards by using the symbols printed on them. If you would like to discuss your journey towards learning the tarot, our gifted and enlightened Genuine Psychics are available to answer your question at any time.